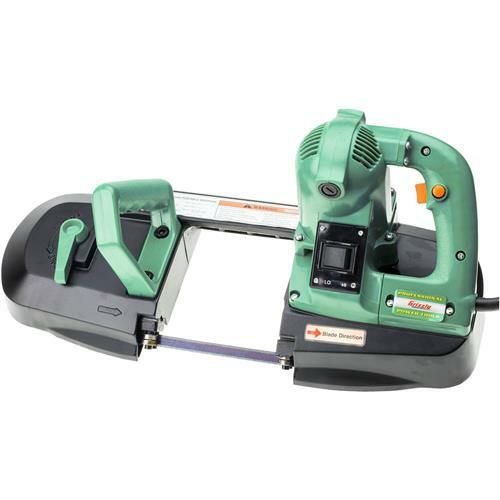 Converts from a bench-top metal cutoff saw to a hand-held portable metal cutting bandsaw in just seconds! Blade size: 44-7/8" x 1/2"
Table size: 7-1/2" x 5-1/2"
Vise never worked and replacement parts dont interchange. Went back and forth with Tech and sent pics and videos of forging and milling differences and they agreed some bad parts that dont interchange. Wouldnt give me a new vise just wanted me to keep paying for shipping on same parts until one might fit. Ive only made a few cuts, but theyve been as accurate as the older, larger saw I used to use at a shop I worked at. I always square things up on my Bridgeport anyway. It was only out about .020, not bad for what this saw is and what Ill use it for. Didnt have room for a bigger saw anyway. If youre reading these reviews, in means youre considering this for whatever reason, no room, price point, etc. its worked well for me. About the G8692 bandsaw /stand. I would recommend it but with a condition. If it's expected to cut anywhere near straight a bit of work will be needed on the work clamping system. First, the work clamp was about 1 1/2" from the blade resulting in about 5" minimum length to be clamped and cut. Second, the work clamp was way out of line both in the horizontal and vertical plane. Like 3/16" in a 2 inch cut! I removed the work clamp, repositioned it closer to the blade, shimmed it up at the back, aligned it with the blade, drilled new mounting holes. I also reversed the moveable jaw of the clamp. Now the saw will cut within 1/32" in a 3 inch cut and clamp onto a 2" work piece. I don't think anybody could ask for more from a tool in this price range. Other than the clamping system alignment problem this seems to be a well made tool that should serve well as long as the user realizes it is not an industrial tool and uses it within it's capabilities. And yes, I would buy it again. I bought this tool when it was out of stock and grizzly kept me up to date until it was available, totally worth it. Haven't used it a lot yet. The blade manages to track well, and it does the job. I think it will do what I need. It is not going to give precise, square cuts that a larger much more expensive machine would deliver. Delivery took a long, long time. I love the saw although I wish the vise portion of the stand would swivel and lock in a few different positions making miter cuts possible. Other than that, it appears to be of high quality. Works well. My only complaint is that the fence screw handled did to come with a screw and it keeps coming off. I have requested a screw replacement. You gotta have some way to cut metal stuff. Using a chop saw can change the metal character because of the heat. You get a lot of sparks too. A band saw is the way to go, but a full sized one is out of the question. This saw is just the right size for most small cutoff jobs. Straight cuts only. I double stick taped an oak block under the blade on the base to support the stock, and used 2 jaw extensions to clamp the stock closer to the blade, because the vise on the stand is inadequate to hold material on its own. Wants to tip out of the vise as you cut. Other wise now works well. Clean straight cuts. 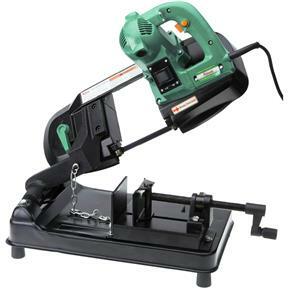 Q: Is a Blade Included with this bandsaw? If so, what type? A:The G8692 Portable Bandsaw does come standard with a bandsaw blade. The blade is 44-7/8” x 1/2” x 0.025 and has 14 TPI (teeth per inch). The blade is a raker blade.